This weekend (my weekend starts tomorrow because I only have one job to attend! ), I have a lot of guild business to work on because our meeting is next week - AND I plan to finish quilting this thing before that. Maybe then I can hand-sew binding (I can't wait to show you what I picked for that) and finish the Lizzie Bennet Diaries. Think I can get there? I think I can... I think I can. Linking up to Needle and Thread Thursday @ My Quilt Infatuation! And, since this is my September goal, linking up to A Lovely Year of Finishes. 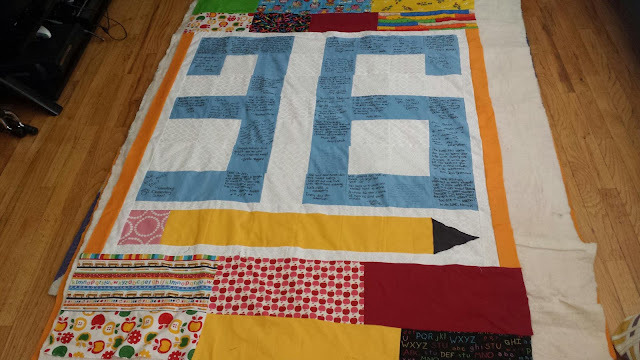 Love the surprise quilt. What a great idea to put the little hand written notes. Hope the school year is going well so far! What a sweet quilt! 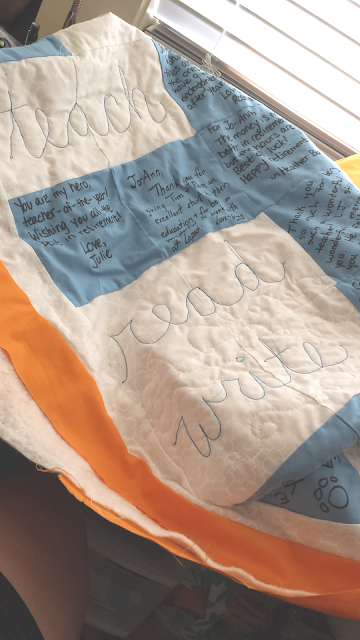 I like word quilting, but pretty much had to relearn most of my cursive, haha. Is good to be busy at work but I hope you settle in to a routine soon and are not so exhausted! That's such a great keepsake for her. You're so sweet to do this, Jess!